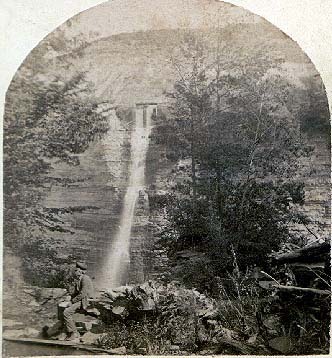 "View across the Gorge, showing the Cascade. The bank is 400 feet high." This view was taken from the west side of the Genesee looking east. The waterfalls was known as the "Bridal Veil Cascade" and was quite popular with tourists. The charming fall was actually the water draining from a waste weir in the Genesee Valley Canal that ran along a manmade ledge in the cliff. For a close up of the weir, click here. 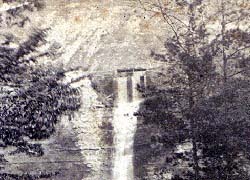 Bridal Veil Fall disappeared when the Canal was closed and drained in 1878. The stereocard includes the following description: " The Genesee, River, at Portage, enters a grand rocky defile, presenting for some distance a succession of magnificent and varied scenes, There are three cataracts, or 40, 80 and 60 feet decent, and the banks of the river are, in some places, from 300 to 400 feet in height." For another view of the Cascade, see Photo 69. This close up shows more detail of the waste weir. Designed to carry the excess water from the Canal, it prevented high water damage to the easily eroded walls of the Canal. You can still find remnants of the structure along Trail #7. Also see our Photo 69 for another view of the Bridal Veil.